With the recent fire that broke out at Notre-Dame in Paris, there has been a lot of discussion about how best to deal with fires in historic or listed buildings. The firefighters who arrived at the scene had a protocol to follow, that had been previously planned in the case of such events. This procedure expressed the order of priority of what needed to be saved: people, art, the altar, any furniture possible and then the building. Following this protocol meant that no one was harmed and most of the historic treasures had been saved. Some of the building was completely destroyed, however, the fire was eventually controlled and a lot of the interior survived, meaning that there is hope for a full restoration. So, how should fire be dealt with in historic and listed buildings? 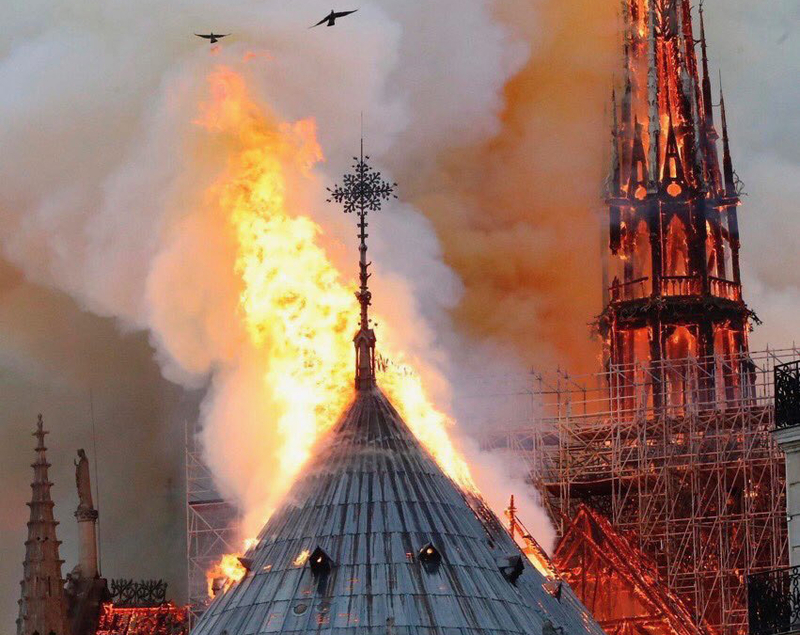 It is vital that there is a procedure in place that states exactly what needs to happen in the event of a fire- just like the one in place for Notre-Dame. This will not only help people to be saved but for irreplaceable items to be retrieved. To plan for the event of a fire, you will need to have up to date building plans. These can help to locate key artefacts, fire exits, evacuation routes and fire safety equipment. All of this information will show how best to respond. Avoiding a fire is the obvious best scenario. A fire risk assessment is a good place to start as this will identify the areas of concern. Once these have been identified, you can take steps to reduce the risk. For example, in a church, a big risk area could be curtains and drapes hanging over walls. To minimise the risk of these, you would ensure they are not placed near any ignition sources such as a lamp or candle and move them away from any fire exits or evacuation routes. Fire safety equipment is key when it comes to tackling a fire. This can include: fire extinguishers, sprinkler system, fire curtains, alarm systems, and anything else that will prevent the spread of fire. Installing fire safety products can be controversial as they can affect the aesthetics of historic and listed buildings, however, there are options that will create minimal disruption to the structure and visuals, whilst still offering protection. After the assessments, plans and modifications have been carried out, they will need to be routinely reviewed. If anything changes, there may be new risks, for example, if there is construction work on site. Or, you may carry out a fire drill which uncovers faults in the original plan. By carrying out regular checks, you will avoid any shortcomings in your plan. Historic and listed buildings are extremely meaningful and important to heritage as they hold so many memories and have survived through events that shape a country. Just like how the Notre-Dame has been standing tall for 800 years, even surviving through two world wars. It takes seconds for a fire to spread through a hole the size of a pen nib. Compartmentation is a way to keep a fire contained in one place, preventing fire and smoke from spreading quickly and taking over the building. By creating these fire-resistant compartments, fire can be suppressed for around 30 minutes (time can vary depending on the building structure). There are different elements to creating a fire safe compartment and there are many things that can reduce the effectiveness. If fire doors are wedged open, the whole building will be exposed to the risk of fire. Even if the rest of the building has perfect measures in place, when fire doors are wedged open the fire will be able to spread anyway. This is why it is against regulations to wedge open fire doors. All fire doors need to be checked regularly to ensure that they are up to a good standard. For more information about how to check your fire doors, click here. Floors and walls made from fire resistant materials: bricks, concrete, stucco, gypsum board. Compartmentalising a fire will only work if the building is kept in a good condition. There needs to be special attention if any work is done on the walls or floors that change the integrity e.g. drilling. If there is any damage it must be repaired, and any gaps or holes need to be filled. Mechanical: pivot system (like window blinds) or curtain system. Intumescent: will react to heat and swell up, blocking all openings. Heating, ventilation and air conditioning systems will all have a type of fire damper.They must be installed in order to close off any gaps in the room and maintain compartmentation in the event of a fire. Fire and smoke dampers need to be regularly checked and serviced. How often, will depend on the environment they are in and what type is in place. However, it is recommended by British Standards to test them every 1-2 years. Following the Grenfell Tower fire in 2017, there have been many investigations into how the fire got out of hand so quickly. The fire started on the 4th floor and in just 12 minutes had spread up 19 floors. The external cladding was the first breach of compartmentation on the tower block. It is said to be the reason for the fire being able to spread up the whole building and therefore entering other flats, which otherwise could have been unaffected. Another breach of compartmentation that contributed to the spread of fire is said to be that the front doors to the flats did not meet fire resistant standards. The doors didn’t last the regulatory minimum of 30 minutes and some of them also had broken self-closers meaning that they were open during the time of the fire. This devastating case has highlighted the importance of compartmentation. Effective compartmentation can save lives if a fire breaks out. It allows for the fire service to tackle the fire and the “Stay Put Policy” to be an effective way to keep residents safe. Compartmentation is especially important for escape routes, so that anyone in the building can safely evacuate. If you are unsure about the compartmentation in your building, contact a fire safety provider who can carry out a survey. Arson is a criminal act which can lead to devastating consequences. Arson in schools is more common than some may think. In the UK there is an estimate of between 1400-1800 school fires each year, with 75% of these thought to be caused on purpose*. It is important that there is a clear understanding on who is responsible for the risk management of fire on the school premises. This could include; school governors, head teachers, the caretaker, the premises manager and Local Education Authority. Once the relevant people have been identified, responsibilities can be delegated and a fire action plan can be put in place. All schools should have a fire action plan that includes instructions on assessment, prevention and recovery. It may even be beneficial to have a visit from a professional external body who can carry out an official assessment on the school. Staff living on site or next to the school means there is a constant monitor on the premises. External doors and windows should have a thief resistant locking system. Intruder alarms should be fitted, and all appropriate people should receive notification in the event of an emergency, including the security providers. Liaising with neighbours and local schemes such as Neighbourhood watch. CCTV should be fitted near all entrance points, plus hidden areas of the premises. There should be an end of day procedure to ensure all exits are closed, locked and alarms are set. Good maintenance should be kept on site so that there are minimal things that can be used to set fire to or ignite a fire with. All rubbish/ recycling bins should be stored in a secure location at least 8 metres away from the building. They should all be kept in a container made from fire resistant materials and locked. Other storage areas such as sheds should also be kept at least 8 metres away from the building to prevent spread. All pipework should be hidden or protected. Electric and gas metres should be in a secure environment. Any mobile buildings should be filled at the bottom to avoid a fire being started underneath. The school and immediate surrounding areas should be checked regularly to ensure there is nothing that could be used to start a fire. Install an automatic fire detection system. Compartmentation (the building is built in different fire-resistant compartments). Install and regularly check fire safety equipment e.g. fire doors, sprinkler systems and extinguishers. Keep all property of high value in a secure location where the contents will be protected and can be retrieved. All staff should be fire trained, there should be appointed fire marshals, and there should be someone responsible for checking all fire safety in the building. It is important to consider these points to ensure that your school building, its content and its people are safe from the risk of arson. If these points are put into action, it could help to reduce the overall amount of school fires and prevent the devastating damage that a fire can cause. Universities and halls of residence have a higher than normal risk of fire. With 80% of students admitting to regularly taking part in activities that risk fire in their accommodation*. One element of fire safety that often seems to be considered as more of a hindrance than help, are fire doors. Fire doors are a vital part of fire safety, especially for places of multiple occupancy. They compartmentalise a room by trapping a fire for 30-60 minutes. This allows more time for the fire service to reach the fire and extinguish it before it spreads through the whole building. If the fire doors in university halls are wedged open, a fire will spread extremely quickly, putting lives at risk and causing damage to housing. So why do students wedge open fire doors? Social reasons- Students have left home for the first time and will want to meet as many people as possible, especially the ones in their living area. An ‘open door policy’ may be applied so that they seem more welcoming to new friends. If every door in their flat is going to close automatically, the students will wedge them open. Practical purposes- Especially on moving in day, students will want ease of access to their room in order to move everything in. Some fire officers will allow a temporary wedging to help with this. However, students may feel this to be more convenient than their door being closed, so are likely to continue using a wedge. To reduce noise- There is a lot of human traffic going through university halls, meaning that the fire doors will be closing regularly. Fire doors are very heavy and some door closers cause them to slam shut. Consequently, leading to students wedging them open to minimise noise. To improve access- Heavy fire doors with automatic door closers can be problematic for people with mobility issues. This may lead to doors being wedged open for ease of access around their flat. May be unaware- Students have been living in a home environment where fire safety may not be a concern and fire doors may not have been around. Because of this students might not realise the important role that fire doors have. Influence of alcohol- Throughout university, and especially freshers week, there will be many parties and nights out- usually with drinking involved. This can be where risky behaviour is increased. For example, 50% of students admit to cooking whilst under the influence*, also known as ‘drunk frying’. Along with this comes drying clothes on electric heaters and smoking inside. On top of this, students may also take batteries from fire alarms, and disable door closers by damaging them. In October 2015, a fire spread through university accommodation in Bristol. The fire was started by an unattended pan of oil left on a stove and it got so severe that all students in the building had to be evacuated. After the fire had been controlled, the building had been deemed unsafe to live, meaning over 100 students were rehomed. No students were harmed from this incident because all the fire alarms went off and everyone evacuated. The video also shows the massive role that fire doors play. You can see that the fire door on one side is completely damaged by the fire and one side is still mostly intact. This is a demonstration of how fire doors compartmentalise a building and help trap a fire to reduce or slow spread. A students priorities are not always in line with fire safety strategies. Students feel in their daily lives that they need to use wedges under their doors because they have no other option. However, there are safer ways to hold open doors. Hold-open devices and free swing door closers can be applied in order to improve access and ventilation, whilst complying with regulations and keeping the building fire safe.